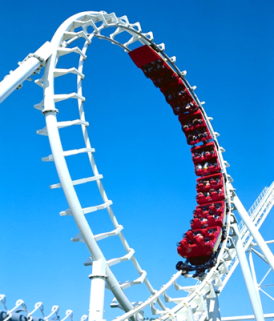 Some people love them whilst others fear them, but how safe are amusement thrill rides? Recently some of our A&D Techeng team based in Brisbane were called to support one of Australia’s most popular theme parks in Queensland. A new amusement ride was purchased by the theme park to invigorate attendance numbers particularly with the school holidays coming. However before the amusement ride could be released to the most daring of thrill seekers, a rigorous risk assessment was performed. This assessment is carried out on all new and existing rides to ensure all safety guidelines are met in accordance to Workplace Health and Safety Act 1995 (QLD) and AS 4024.1-2006 – Safety of Machinery. In this instance, the risk assessment found the thrill ride did not fully comply with compulsory safety requirements so our engineers where sought out to advise on possible solutions to improve the safety rating of the new amusement purchase. The requirements were reviewed and A&D Techeng found the optimal way to meet safety category ratings of CAT 3 and CAT 4, was to install an Allen Bradley CompactGuard PLC with safety IO on Ethernet/IP and category rated switches. A&D Techeng used the risk assessment to map out the electrical design (CAD), program the PLC, manage the electrical installation and commission the ride. The PLC was an ideal solution as it is used to monitor safety measures as well as being able to perform control functions for the amusement ride. Once the thrill ride was upgraded with the appropriate changes, the ride was then re-evaluated to ensure that the requirements of the risk assessment were achieved. With the safety of the amusement ride now successfully validated, we are sure this new exciting thrill ride will get even the most well-seasoned thrill seekers’ hearts racing. We thank the theme park team for choosing us to be part of this successful project.